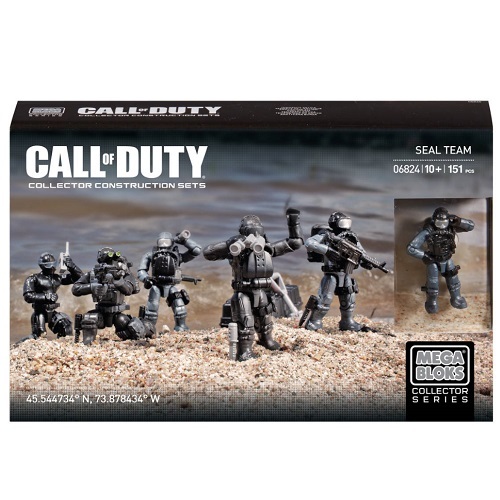 Product Detail Summary: The most adaptable special operations soldiers in the world, the SEAL Team are the elite first-strike unit. Awaiting deployment on a small buildable naval platform, each of the five micro action figures possesses extreme poseability in practically any combat scenario. Authentic in-game accessories include wetsuits, interchangeable boots and flippers for naval or land insertion, removable combat vests, backpacks, combat knives, and more, that allow for mission-specific customization. • Includes 51 highly detailed, interchangeable accessories and weapons like removable combat vests, flippers and boots, ammo pouches, combat knives, binoculars, walkie-talkie, first aid kit, flashlight, laptop and more!